Another reason to heart your slow cooker--it can take rock-hard, pale pears and turn them into vermillion beauties! I can't believe I waited so long to make these scrumptious and stunning treats--for not much labor, it can look like you really went all out for dessert! One quick trip around the web will reveal more variations on this recipe than you can count. I noticed a lot of them called for crazy amounts of sugar, cloves, nutmeg, etc. You just want enough sugar to take the bite out of the wine. I dialed down the spices for the most part and used the fruit I had on hand for flavoring. Using what you have makes it all the more of a Recession Recipe! The most time-consuming part of this dessert is the peeling, but even that doesn't take more than 10 minutes. 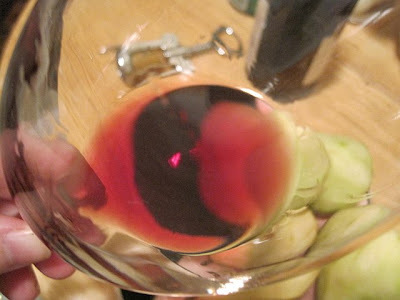 A lot of recipes recommended Bosc, but Anjou were on sale that week, so that's what I used! The rest of the hands-on time was easy: pour the entire bottle of wine ($7.99 on FreshDirect.com!) into the cooker. Correction. Sample some of said wine first, you know, for a quality check. 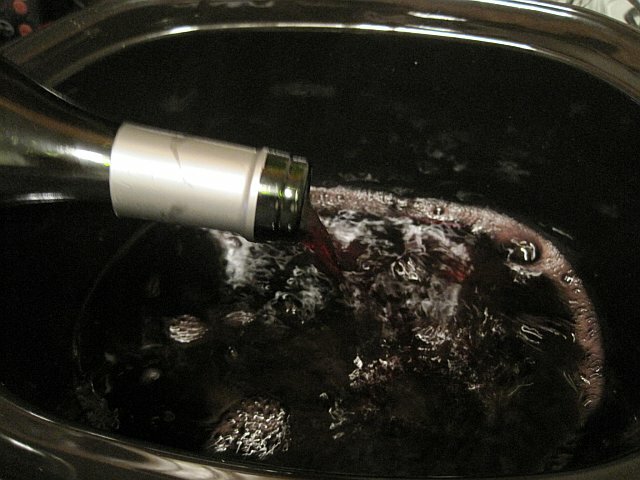 THEN pour the rest of the bottle into the slow cooker, which you set on 6-8 hours. 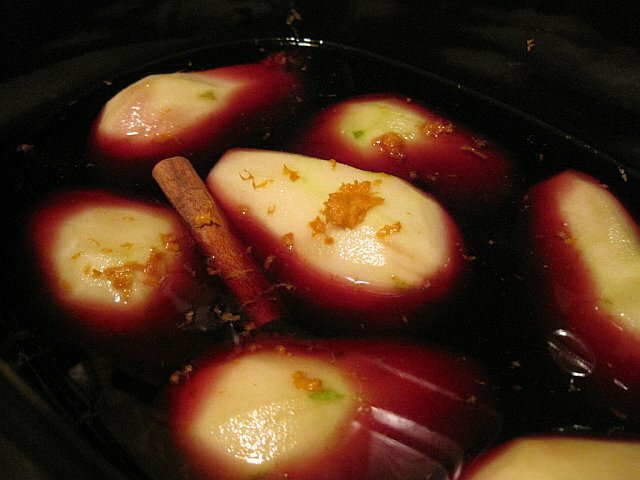 Add the sugar and stir to dissolve, then gently place the pears, add spices. Let them simmer for about 30 minutes, then come back and flip them over with a spoon (or something else that won't leave a mark). I flipped them over every hour or so just to keep the coloring even. 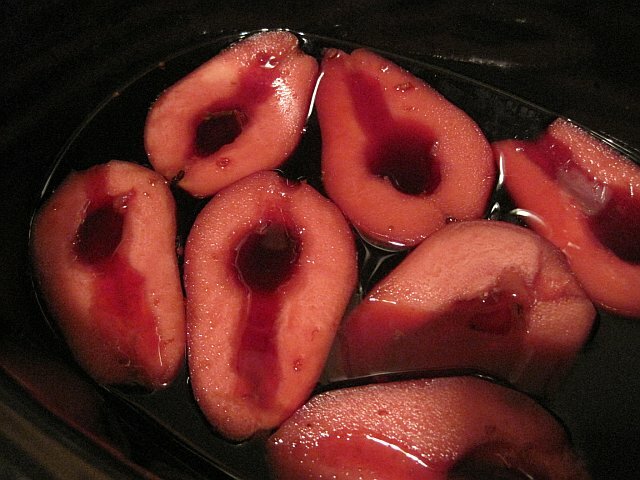 The smell of these pears poaching is absolutely heavenly. It will fill your whole house with a spicy, relaxing aroma. 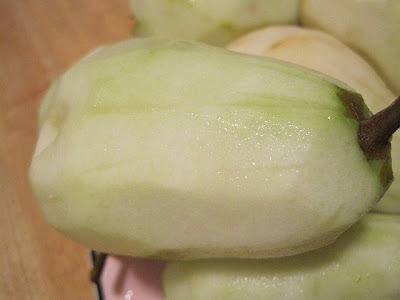 You know they're done when a knife or fork easily pierces the pear. 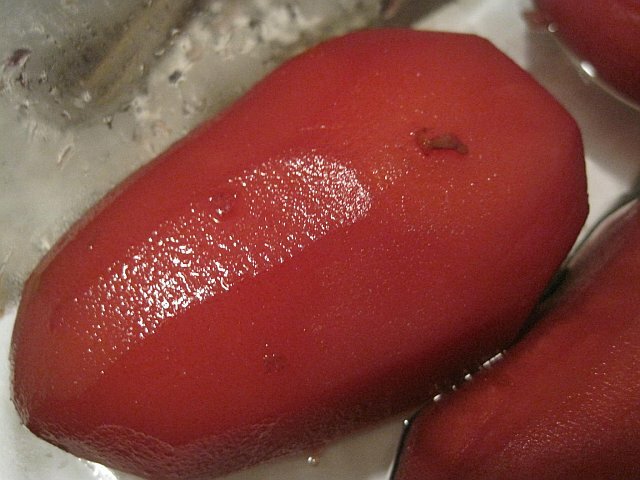 Remove them from the cooker, put them in a dish (preferably glass), and cover them with the juice. Chill them a few hours, or even better, overnight. I recommend removing the cinnamon stick if you're leaving it overnight, otherwise the cinnamon overpowers everything else. Resist the urge to drink the entire amount of the wine/spice mixture. Holy moley is this delicious! 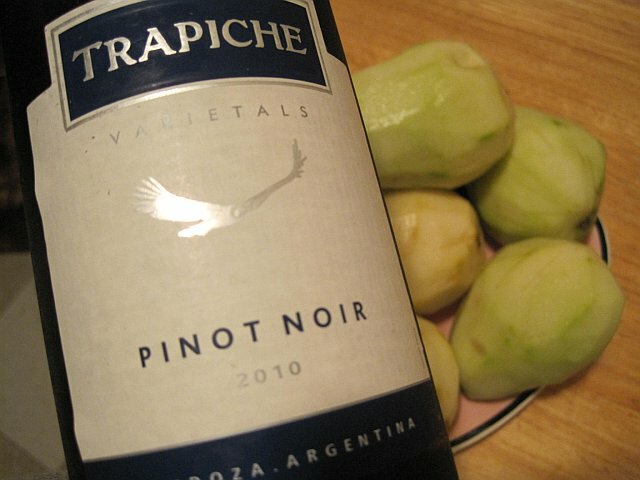 The part that surprised me about this dish is how extremely unripe pears soften over time in the cooker. 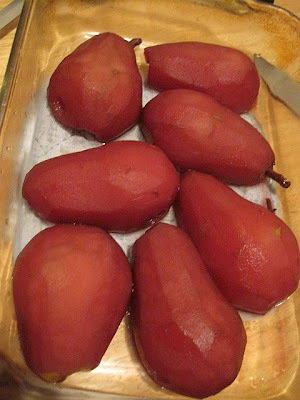 Not all of my pears cooked as evenly, but most of them came out tender and delicious. Serve with a dollop of freshly whipped cream or good-quality vanilla ice cream. This gets even more delicious day after day. 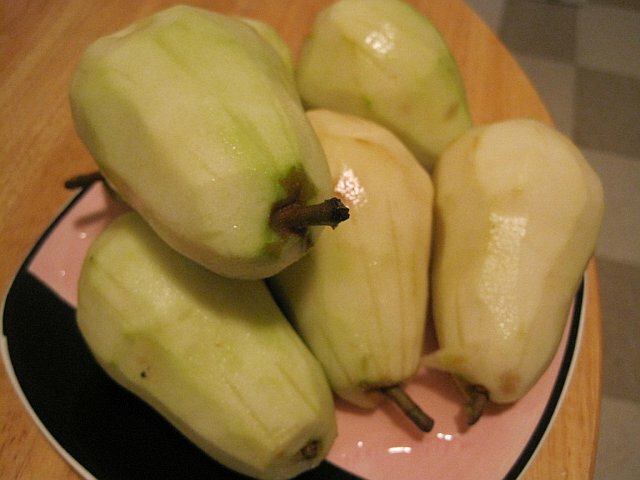 I had leftover pear halves for dessert for a good few days! Peel and rinse pears, pat dry. Squeeze lemon juice over them to slow browning. Add bottle of wine to crockpot, add sugar and stir to dissolve. 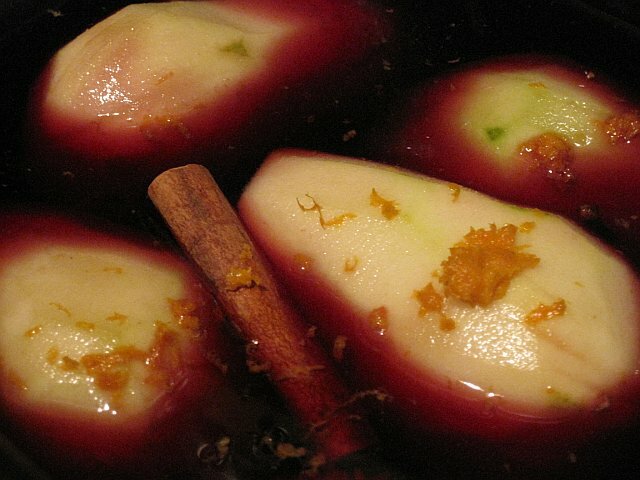 Gently place pears in liquid, then add spices and fruit zest/juice. Flip pears every hour or so to ensure even coloring. 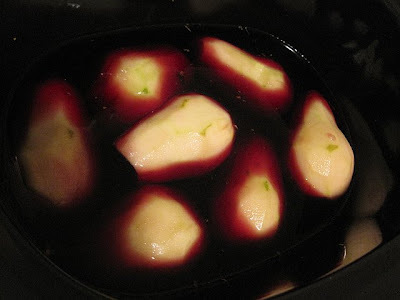 Once pears are easily pierced, remove from crockpot and let cool. 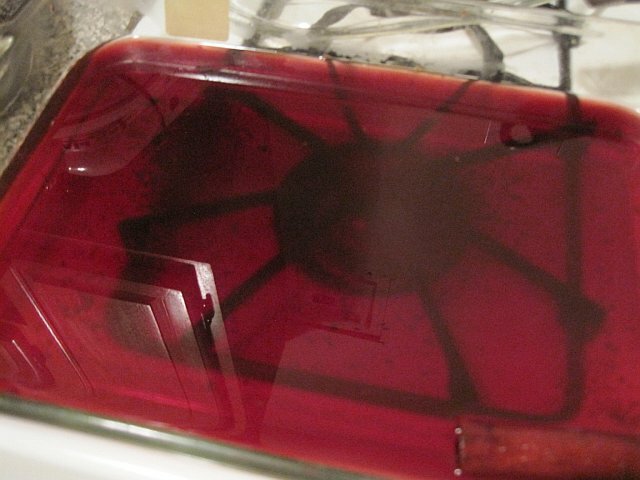 Pour juice over them and cover, chill several hours or overnight if you can. 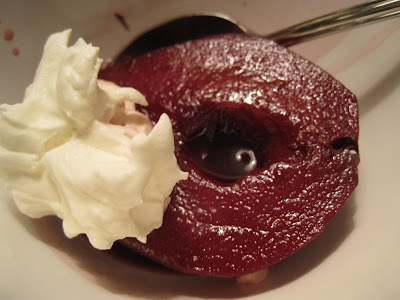 Serve with freshly whipped cream or vanilla ice cream. Enjoy!